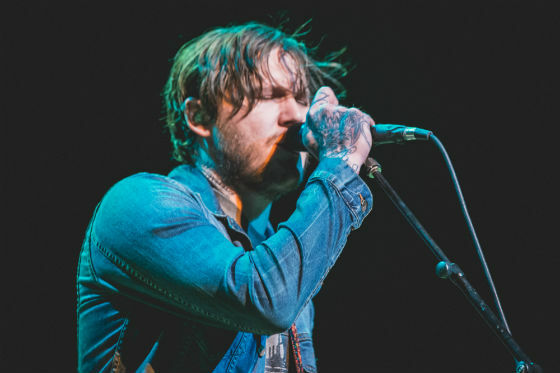 It's been half a decade since the Gaslight Anthem toured across western Canada, but the New Jersey punk rockers finally returned with some new songs under their belts. The stage backdrop was the album art from 2014's Get Hurt, and most of the set came from their last two records, with tunes such as "Biloxi Parish," "Helter Skeleton," "Here Comes My Man" and "Stray Paper" making the cut. The band's 2008 breakout record, The '59 Sound, also got some attention, though a few little things were switched up. "Great Expectations" was played much slower and seemed much more sombre than it does on the original recording. Covers of Pink Floyd's "Wish You Were Here" and Bob Dylan's "Changing of the Guards" also found their way into the band's set, and got a strong response from the crowd. The Gaslight Anthem proved they're more focused on moving forward than recreating the past, which kept the whole experience fresh and entertaining. The guys were energetic, as vocalist/guitarist Brian Fallon waxed personable with the crowd in between songs. Near the beginning, he poked fun at the barricade and reached out for some high-fives. The guys were also burning incense onstage, which added something cool to their set, though the people stuck in the balconies probably never noticed it. A 100-plus-year-old theatre filled with soft seats isn't the best place for a rock show, and the sound wasn't perfect either. Fallon's vocals sounded muffled and never really rose over the drums as much as they should have, which took away from their performance. There wasn't an official encore because Fallon said they could squeeze in more songs if they skipped walking off stage. The guys tossed in the title track from the underrated American Slang, which was nice, because that record features some of their strongest songs. The last time the band played Winnipeg, they closed out with "The Backseat," but this time they chose "We're Getting a Divorce, You Keep the Diner," which was a strong way to close the night. It was hard not to feel disappointed with the openers when you remember that Gaslight previously brought the Menzingers and Fake Problems, but Northcote and Sammy Kay did an admirable job filling the void. Matt Goud is from Carlyle, SK and has been through Winnipeg tons of times under the Northcote moniker, but he's usually not playing venues as big as the Burton Cummings Theatre. Instead of going acoustic, he was also plugged in with a full band, which worked in his favour. Goud never seemed nervous and came across as charismatic and charming, as he usually does. For "Worry," the guys left the stage and he played the tune acoustically. He also mentioned that he's working on a new record and played a newer song that seems to be called "Stronger Than You Know." When Sammy Kay hit the stage first, the theatre was pretty empty, but the singer-songwriter and his backing band tried to put on a good show. Kay looks a bit like Fallon and his band sounds a lot like the Gaslight Anthem, which made them an obvious, but somewhat repetitive choice. Most of the set was culled from his new record Fourth Street Singers, and they kicked the night off with a bouncy, harmonica-driven tune called "Saints and Sinners."